The chicks are now just over a month old and have a bunch of feathers growing along their back and wings. They are very adventurous and keen to get up high on objects around the garden. I took this as a sign and removed their cage yesterday and put them in the strawyard with the other chooks just before twilight. Jenny was keen to get up on the roost and one little chick followed her. The others were not so up front so Jenny reluctantly joined them on the straw for the night. Tonight there are three up there with her with one of the ground due to a sore leg which ‘she’ did not seem to be too fussy about so I have left her to rest for the night and will investigate in the morning. I couldn’t see any point in stressing her and the rest of the chooks right before roosting time. After only a month they are acting like adult chooks in many ways. Running, flying in short bursts, taking dust baths and scratching around. They are still peeping like chicks. The rest of the chooks do not seem to mind their presence in the coop so I figured it was probably a good time to get them in with them and that way they can be in the dark a little longer rather than stirring at 4am in the morning! Clarice is the solid little layer at the moment as Penny is clucky and Stella is only laying every second day or so. 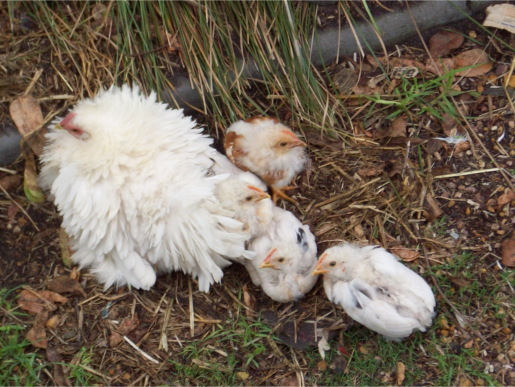 Penny and Clarice sleep in the nest overnight, with Stella on the roost with Jenny and the chicks that can make it.